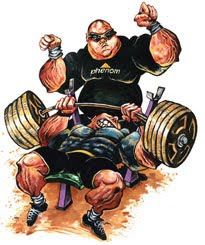 This weeks feature will look at bench pressing and different methods of increasing poundage on your bench. I always have preached the best method of ensuring a good bench starts before you have even moved the weight out of the racks. The set up is imperative to bench performance. Once you have that set up mastered then it is time to start focusing on different methods of increasing poundage. We will look at how to increase bar speeds, overload sticking points and increase hole and lockout power. Hold onto your hats, as there is some cool ways of increasing your bench that lay outside of just tech work. If anyone has there own methods during the week feel free to post them to the comments section. Knowledge is always important when it comes to approaching any type of training and no one person knows it all.